The article discusses various types of heat exchanger designs, features, and the characteristics of heat pump system tested. It looks in more detail at the applications of the technology, distribution systems, and the thermal performance of heat pumps. Geothermal heating can be more efficient than electric resistance heating. The earth’s surface acts as a huge solar collector, absorbing radiation from the sun. In the UK, the ground maintains a constant temperature of 11-13oC at 30 metres below the surface all the year around. Among many other alternative energy resources and new potential technologies, the ground source heat pumps (GSHPs) are receiving increasing interest because of their potential to reduce primary energy consumption and thus, reduce emissions of greenhouse gases. Direct expansion GSHPs are well suited to space heating and cooling and can produce significant reduction in carbon emissions (Figure 1). In the vast majority of systems, space cooling has not been normally considered, and this leaves ground-source heat pumps with some economic constraints, as they are not fully utilised throughout the year. The tools that are currently available for design of a GSHP system require the use of key site-specific parameters such as temperature gradient and the thermal and geotechnical properties of the local area. A main core with several channels will be able to handle heating and cooling simultaneously, provided that the channels to some extent are thermally insulated and can be operated independently as single units, but at the same time function as integral parts of the entire core. Loading of the core is done by diverting warm and cold air from the heat pump through the core during periods of excess capacity compared to the current needs of the building. The cold section of the core can also be loaded directly with air during the night, especially, in spring and fall when night times are cooler and day times are warmer. The shapes and numbers of the internal channels and the optimum configuration will obviously depend on the operating characteristics of each installation. Efficiency of a GSHP system is generally much greater than that of the conventional air-source heat pump systems. Higher COP (coefficient of performance) is achieved by a GSHP because the source/sink earth temperature is relatively constant as compared to air temperatures. Additionally, heat is absorbed and rejected through water, which is a more desirable heat transfer medium due to its relatively high heat capacity. • Heating tubes in roads or footbaths to melt snow in the winter. • Energy to heat hot water. • Requires less mechanical room space. • Requires less outdoor equipment. • Does not require roof penetrations, maintenance decks or architectural blends. • Quiet operation and reduces operation and maintenance costs. • Requires surface area for heat exchanger field. • Requires additional site co-ordination/supervision. Air source heat pumps convert the energy created by the outside air into heat, giving a comfortable temperature inside the home and reducing heating costs by on average 50 per cent compared to traditional systems. Exhaust air heat pumps provide hygienic air inside the home, whilst capturing heat energy from lighting, people and domestic appliances, and recycling it. As with all heat pumps, air source models are most efficient when supplying low temperature systems such as under-floor heating. It can extract heat from the air even when the outside temperature is as low as minus 15° C. An air source heat pump system is compact and requires no storage space for fuel. The first is the initial cost. The GSHPs typically cost more to install than air-source heat pumps. Unless one has a large house with a large heating load, the energy savings might not offset the additional installation cost during the lifetime of the heat pump. The second disadvantage is that it is difficult to find a qualified installer in the area and there may be a long wait when the system emergency service is needed. There are few installers because most installations require unique designs. For example, sites must be carefully evaluated for soil temperatures, moisture levels and heat conductivity. This is important, as the system must be designed to keep the soil near the house from freezing when the heat pump extracts heat from the ground. The third disadvantage is that installation requires some excavation or drilling. Some systems require extensive trenching and expensive landscape repairs. Others are installed with a drill in a fairly stationary location, causing less damage. Additionally, it can be expensive if the underground piping requires repair, and the landscaping options may be reduced. • Electrical input and controls: The system will be requiring an electrical input energy, three-phase being preferred, but single phase is perfectly adequate for smaller systems. A specialised controller is required to provide temperature and timing functions of the system. 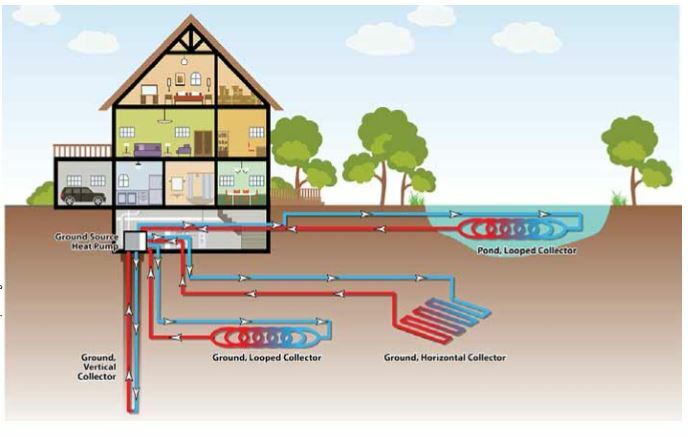 • The heat distribution system: This is either underfloor heating pipes or conventional radiators of large area connected via normal water pipes. • A heat pump packaged unit: DX GSHP type (approximate the size of a small fridge). Water-source heat pumps use a body of water for their heat source. They typically use well water, but sometimes they use lakes or streams. Water source heat pumps – particularly, those using well water – have the same advantages as GSHPs. The water they use is usually warmer than winter air and temperatures are more stable. recover this additional expense unless the house has a large heating load. Hence, water source systems should be carefully evaluated in light of the following points. • If the water-source is a stream or lake, then check if it is legal to use it as a heat source. Some areas have environmental laws that prevent this use of water (or have restrictions that make it more expensive), as the water gets too cold to use in the winter. • If the water-source is a well, then it should have adequate flow and temperature to meet the heat pump requirements. • Some localities require disposing the water via the sewer, which can increase the sewer bill. Others may require having a second well to return the water to the aquifer. Outdoor thermostats sense the outdoor temperature and lock out the use of secondary heating devices (supplemental heat) unless the temperature drops below a preset point (except when the heat pump is not working and needs emergency heat). The advantage of this strategy is that it is a positive lockout that will not be defeated by ‘thermostat fiddlers’. Smart thermostats (microprocessor controlled) sense only the indoor temperature. They will not turn on supplemental heat unless the heat pump is unable to keep the house at the desired temperature. The advantage of this strategy is that it is tied to indoor comfort. There is considerable debate about which is the better strategy. But either one is clearly better than no lockout at all. Most heat pumps have controls that cause all of the supplemental heat to be on at the same time. However, there are important benefits to staging supplemental heat. Staging refers to turning the supplemental heat on in two or more stages. The first stage comes on in mild temperatures just below the heat pump balance point. If the temperature falls below a point that the first stage is not enough, the second stage provides more heat. There are two important benefits of staging supplemental heat. First, more comfortable and second, it benefits utility ratepayers. One of the major costs of operating an electric utility is the cost of ‘peak’ power as defined by a high point of electrical customer demands. This peak occurs during the winter when lots of heating systems need power. By staging the backup heat, the utility’s peak is likely to be lower, reducing utility operating costs. These savings are particularly important when they can help to avoid the cost of expensive new electrical generating facilities. Depending on the control system, staging supplemental heat may reduce the on/off cycles of the heat pump. Reduced cycling can increase the longevity of the heat pump. There are many types of defrost controls. They can be grouped into two categories. First, time and temperature and, second, is demand. 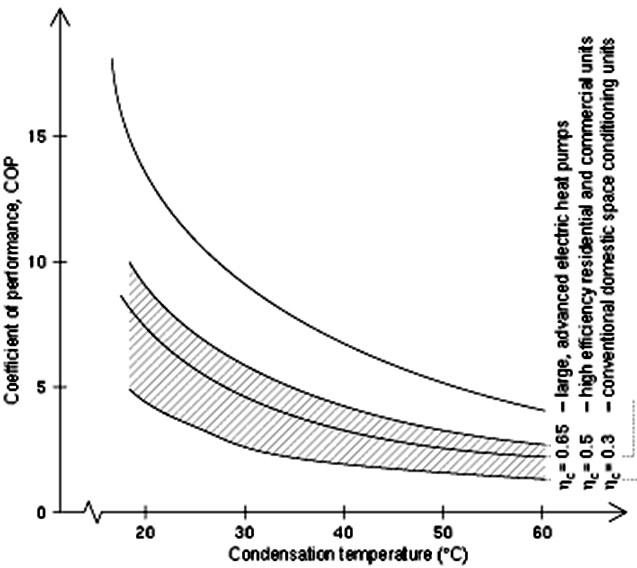 Time and temperature controls turn on the defrost cycle at specified intervals whenever the outdoor temperature reaches a predetermined point. It is assumed that below a certain outdoor temperature there will be frequent frost formation and defrost will be necessary. Unfortunately, this can result in unnecessary defrost cycles, which waste energy. There may not actually be frost during the times specified. Demand controls actually detect the presence of frost on the outdoor coils. When the controls sense frost, they initiate the defrost cycle. When the frost is melted, the defrost cycle is terminated. Since the defrost cycle is only used when needed, this is much more efficient and reduces heating costs. The terms ‘emergency heat,’ ‘auxiliary heat’ and ‘supplemental heat’ are often used interchangeably, since they all refer to the heating unit(s) that add to, or take over from, the heat pump when needed. Manufacturers are understandably reluctant to put a light called ‘emergency heat’ on their equipment, so the emergency heat indicator may have a different name. Nevertheless, a thermostat with an emergency heat light should be specified, even if it goes by a different name. A supplemental heat indicator, called ‘auxiliary heat’ indicator on some thermostats, tells when the supplemental heat is on. Unlike emergency heat, supplemental heat is a normal occurrence. It comes on when the heat pump alone cannot keep the house warm enough. The heat pump keeps working while the supplemental heat is on. To prevent compressor damage, a heat pump should have pressure sensors that indicate either excessively high or dangerously low refrigerant pressures. If either condition occurs, the heat pump should automatically shut down, and switch on the emergency heat if needed. These adverse conditions are often accompanied by high temperature. Accordingly, those in the heat pump business often call these pressure/temperature switches. Heat pump compressors are designed to compress gases, not liquids. Liquids are much more difficult to compress than gases. If liquid refrigerant enters the compressor, it may damage the compressor. Since compressors are very expensive to replace, heat pumps should be protected with an accumulator. 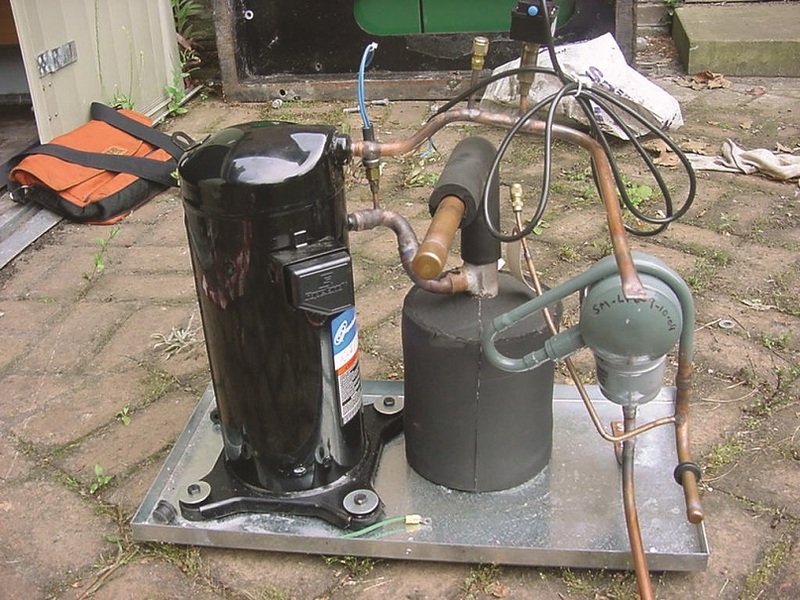 The accumulator traps liquid refrigerant to prevent it from entering the compressor. However, scroll compressors are the exception to this rule as they can handle some liquid refrigerant without being damaged, so they do not require an accumulator. The filter/drier does two things: It filters the refrigerant to remove dirt and other impurities that can cause damage to the compressor and other heat pump parts. Also, it removes moisture from the refrigerant. Moisture can cause a variety of problems, so it is important to remove it from the system quickly. When the heat pump is off during cold weather, liquid refrigerant can migrate to the compressor crankcase, reducing lubrication effectiveness. When the heat pump comes on, the refrigerant evaporates rapidly. However, foam forms in the oil preventing adequate lubrication of the compressor and shorten its life. The compressor should be equipped with a crankcase heater, which prevents the refrigerant from liquefying in the oil. Most crankcase heaters are on at all times. Some are designed to operate only when needed. Again, the scroll compressor is the exception, as it does not require a crankcase heater to operate safely. The outdoor unit may have a shorter life in coastal locations where salt air corrosion is a problem. 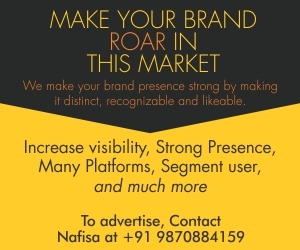 Consequently, some companies manufacture outdoor units designed and built to resist salt air corrosion. A long-awaited heat pump has just come on the market. It is called a “variable speed” heat pump because it adjusts its output to match the heating or cooling requirement of the home. This allows the heat pump to run continuously rather than starting and stopping frequently during mild weather. This is more efficient and reduces wear. It can also improve comfort since the fan speed is matched to the heat output, reducing drafts when the output is low. Another recent development is a new type of compressor called a “scroll compressor”. It has a rotary motion that reduces noise more than any other rotary compressors, due to its unique design. It has a higher efficiency at lower temperatures than reciprocating compressors for better seasonal heating performance. It also tolerates small amounts of liquid refrigerant, so it does not require an accumulator or crankcase heater. It is difficult for the consumer to verify that the contractor properly sizes and installs the system, and they should at least let the contractor know the expected criteria to be met. If it is in a utility-sponsored heat pump programme, the utility may help ensure the system meets these criteria. There are three reasons that a heat pump should be properly sized for the house, cost, durability and efficiency. Cost: Large equipment is more expensive. If the system is too large, too much money will be spent on it. On the other hand, if the heat pump is undersized for heating, supplemental heat will operate too often, increasing the electric bill. Durability: Most wear and tear on a compressor occurs when it starts up. Oversized equipment will cycle on and off more often than accurately sized systems. Efficiency: Oversized systems have shorter “on” times, which means a greater portion of “on” time is spent getting started, an inefficient part of the heat pump cycle. • The dimensions of the floors, basement walls, above ground walls, windows, doors and ceilings. • The energy efficiency of these components (insulation, window types, air tightness, etc.). • Local weather: Loads should be calculated for a cold winter day (but not the coldest on record) and a hot summer day (but not the hottest on record). The local electric utility may be able to recommend appropriate design temperatures. There are several widely accepted methods of calculating heating and cooling loads. The most popular are based on methods and data developed by the American Society of Heating, Refrigerating and Air Conditioning Engineers (ASHRAE). One of the best is called Manual Journal: Load Calculation developed by the Air Conditioning Contractors of America (ACCA). Manufacturers often simplify ASHRAE and ACCA methods so that the process can be speeded up. Most major manufacturers provide forms that help contractors’ size their heating equipment. If the forms are based on ASHRAE or Manual Journal, the contractor will probably do a good job of estimating the sizing requirements. Load calculations should be done for each room in the house, because each room has its own heating and cooling requirement. It’s the only way contractors know how much heating or cooling to deliver to each room. Otherwise, they can only guess at duct sizes, and deliver incorrect amounts of heating or cooling. Areas that are open to each other are treated as one “room”. For example, one “room” could include kitchen, family and dining areas. 2. Choose a unit that is undersized for heating, realising that the supplemental heat will operate more than optimal, hence, reducing the potential savings. Assume that the ideal heating unit in the climate has a typical balance point near -1.2°C. There is a range of 3 to 5 degrees on either side. Two heat pumps in the graph are close enough. The smaller heat pump has a balance point of 0°C, and the larger one, -2.7°C. Figure 2 shows the relationship between the heating requirement of the house and the heat output of four hypothetical heat pumps. The four heat pumps are different sizes (they have different heat outputs), so the balance point occurs at different outdoor temperatures for each. This graph can help to choose the best heat pump for heating. None of the units give the exact balance point and the cooling load should be checked to see which one is acceptable. If the larger unit is outside the boundary of 125-150 percent of the cooling load, then the smaller unit would be chosen. If both were in the acceptable range for cooling, the larger unit would be chosen for increased heating economy. One of the most important aspects of proper installation is to ensure that the ductwork can deliver adequate airflows to maintain comfort in the house. But even more importantly, the airflow needs to be adequate to prevent damage to the heat pump. Airflow must meet the manufacturer’s specifications. Otherwise the refrigerant will not be able to get rid of excess heat. If the refrigerant gets too hot, its pressure may exceed the limits of the compressor and cause it to fail. Replacing a compressor is expensive; it costs more than the added cost of properly designing and installing the duct system. Most customers are aware of the warm air supply outlets because they deliver warm air to the house. And it is easy to figure out that there are usually ducts that connect the heat pump to those outlets. However, it is easy to overlook the return side of the system – the ducts and grills that carry air back to the heat pump. In fact, the return airside is often installed as though it’s an afterthought. Ideally, there is a return grill and duct in each room where there is a warm air supply. That is usually expensive, but it is worthwhile to get as many returns as practical. At a minimum, there should be one for the main living areas and one for the bedrooms. It is also worth considering separate returns for large living rooms and master bedrooms. A good return air system can help reduce differences in pressure throughout the house, reduce drafts and improve comfort. Terminals are the registers, vents and grills at the ends of the ducts that deliver air to rooms or return air to the heat pump. Terminals should distribute conditioned air properly in each room of the house. The room-by-room heat load calculations mentioned earlier tell the contractor how much airflow each room needs. Adjustable duct dampers must be installed so airflow can be set for each room, according to the room-by-room heat load calculations. After the system is installed, the heating contractor should “balance” the system by adjusting each damper for correct air flows. These dampers are usually found in branch ducts near where they take off from the main duct. Once the dampers have been adjusted to balance the system, they are usually not moved unless the system is modified. Air leakage from ducts is typically one of the main sources of heat loss in the house. Ducts should be sealed at joints between sections, along seams in individual duct sections, and where ducts penetrate from unheated to heated areas. Ducts are typically sealed with duct tape. Aluminum tape is more durable than cloth varieties. Ducts passing through unheated areas such as garages, crawl spaces and attics should be insulated. Northwest regional conservation standards require sheet metal ducts to be insulated with R-11 insulation and insulated flex duct with two layers of R-4 or one layer of R-11 insulation. Some contractors use flexible ducts with insulation already built in. Because flexible ducts can be installed by less experienced trades’ people than required by sheet metal ones, there is some concern that flexible ducts encourage poor installation practices. However, flexible ducts should be installed according to the following guidelines. 1. Use R-11 or “double wrap” ducts (two layers of R-4). 2. Make all bends gradual so airflow isn’t restricted. 3. Make connections between sheet metal and flexible ducts with metal or nylon clamps. 4. Seal connections (aluminium duct tape) between flexible and sheet metal ducts. 5. Support flexible ducts so they do not sag (restricting air flow) using supports at least 2.5 cm wide. 6. Stretch duct to its full length so air passages are as smooth as possible. The most economical application of GSHPs is in buildings that require significant space and water heating and cooling over extended hours of operation. Examples are retirement communities, multi-family complexes and schools. Building types not well suited to the technology are retail shopping malls, office buildings and other buildings where space and water heating loads are relatively small or where hours of use are limited. A typical seasonal performance factor for a GSHP system with an electrically driven vapour compression cycle heat pump is 3.0 and high efficiency, heating only heat pumps can give seasonal performance factors of 3.8. The highest seasonal performance factors are for systems with horizontal collectors with direct circulation supplying low temperature heating systems, for which seasonal performance factors often exceed 4.0 and are expected to reach 5.0 in the near future (Figure 3). The COP of a heat pump is closely related to the temperature lift, i.e., the difference between the temperature of the heat source and the output temperature of the heat pump. The COP of an ideal heat pump is determined solely by the condensation temperature and the temperature lift (condensation – evaporation temperature). Figure 4 shows the COP for an ideal heat pump as a function of temperature lift, where the temperature of the heat source is 0°C. Also shown is the range of actual COPs for various types and sizes of real heat pumps at different temperature lifts. Heat pumps can offer the most energy efficient way to provide heating and cooling in many applications, as they can use renewable heat sources from the surroundings. Even at temperatures considered to be cold, air, ground and water contain useful heat that is continuously replenished by the sun. By applying a little more energy, a heat pump can raise the temperature to the required level. Similarly, heat pumps can also use waste heat sources such as from industrial processes, cooling equipment or ventilation air extracted from buildings. A typical electrical heat pump will just need 100 kWh of power to turn 200 kWh of freely available environmental or waste heat into 300 kWh of useful heat. Because heat pumps consume less primary energy than conventional heating systems, they are an important technology for reducing emissions of gases that harm the environment, such as carbon dioxide (CO2), sulphur dioxide (SO2) and nitrogen oxides (NOx). However, the overall environmental impact of electric heat pumps depends also on how the electricity is produced. Heat pumps driven by electricity from, for instance, hydropower or renewable energy reduce emissions more significantly than if the electricity is generated by coal, oil or gas fired power plants.